Apparently even with our remarkable technical capacity to manufacture smartphones that are more powerful than all of NASA’s computing power in 1969, we still can’t really get to grips with the elusive nature of radio spectrum. To unpack this problem, let’s go back to basics. What is Electromagnetic Spectrum and Why Does It Require Regulation? Spectrum is not actually a thing, it is simply the range of possible frequencies for electromagnetic radiation. By varying the size and frequency of radio waves, we are capable of sending information wirelessly. This was first achieved with voice and telegraph but has now evolved into digital communication capable of transmitting anything that can represented digitally from documents to sound to video. So what does wireless communication look like? Imagine a still pond into which you have dropped a single pebble. It is easy to see the propagation of waves caused by the stone. Now imagine twenty people dropping stones into the same pond at the same time. Can you still see the waves caused by your stone? Unlikely. This is called interference. You can no longer see your waves. While radio waves are not physical waves like water, they interfere with each other in a similar sort of manner. When the signals from two television stations overlap, you can no longer distinguish the program you wanted to watch. Counter-intuitively, radio waves are not destroyed when they collide with each other. They pass through each other. Thus if you had the magical ability to colour only the waves caused by your pebble, you would clearly see your waves again even though others were dropping pebbles at the same time. The technical meaning of “interference” is at odds with its more colloquial meaning which is to block or obstruct. 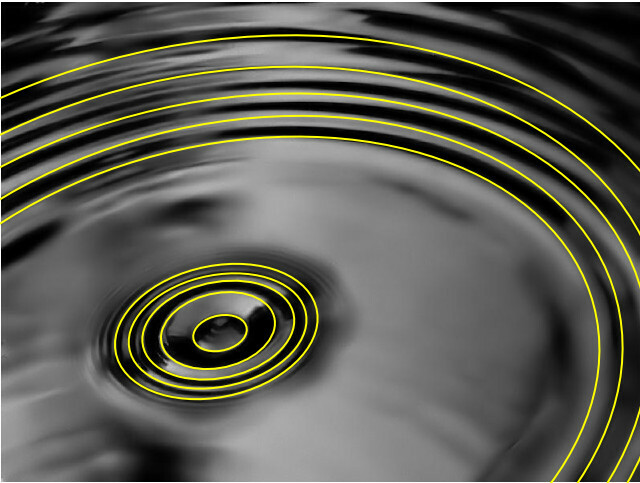 When radio waves interfere they don’t impede each other but they can make the original wave form hard to recognise. And that brings to the most significant reason why radio spectrum is regulated and that is to prevent interference. Another reason to regulate spectrum is coordination to encourage people doing similar things and using similar technologies to use the same frequencies. In the early days of wireless communication, interference was an easy problem to solve. The range of available spectrum was vast and demand was comparatively small. Interference could be solved by making sure that people using spectrum in the same geographic region were allocated individual bands of spectrum that were well apart from each other in the spectrum band. This strategy was reasonably successful for nearly 70 years. And so things might have continued to this day had it not been for the explosion of demand for wireless spectrum from broadband service providers and mobile operators. In the last 15 years, spectrum has gone from an abundant to an apparently scarce resource. But is it truly scarce? It is certainly true that demand currently exceeds supply but there is debate as to the nature of the scarcity and that debate is rooted in the nature of what spectrum is and how, as a result, it should be treated. So What Kind of a Thing is Spectrum? A key consideration when looking at public versus private access to any resource is whether that resource is rival or not i.e. does use of it by one person preclude use by another. Rival goods tend to become private property whereas non-rival goods such as solar power, for example, are public goods that do not require explicit management. And of course there is a range of goods in between which are partially rival such as the oceans and nature in general which are non-rival as long as care is taken to ensure the resource is tended and non-overused. Historically, regulators have been obliged to treat spectrum as a rival good because of interference. In fact, in order to ensure the absence of interference for television broadcasters, regulators were obliged to establish spectrum frequency no-man’s-lands between television channels to reduce the chances of stray interference. However, the now rapid evolution of both wireless and information technology obliges us to reconsider how we think about spectrum and spectrum management. Is spectrum a rival resource? The answer is fuzzier than it used to be. First we have to acknowledge the steady increase in spectral efficiency in wireless technologies. Every year we are able to pack more data into less spectrum with less power. This efficiency is typically expressed as bits per hertz per km2. While spectrum is not infinite, the trend towards efficiency increase shows no immediate sign of slowing down. In fact, wireless pioneer Martin Cooper has coined a law similar to Moore’s Law in which he argues that spectral efficiency has doubled every 30 months since Marconi patented the wireless telegraph in 1897. The evolution of radio and antenna design has meant that with increased sensitivity we can now communicate the same information with much less power. You can imagine old television broadcast transmitters as effectively having to “shout” at the relatively deaf television sets. But sensitivity is only part of the story. Engineers are making great strides in mitigating wireless interference. It is increasingly possible to design wireless technologies which are sensitive to other radio transmissions and which can operate in “noisy” environments. 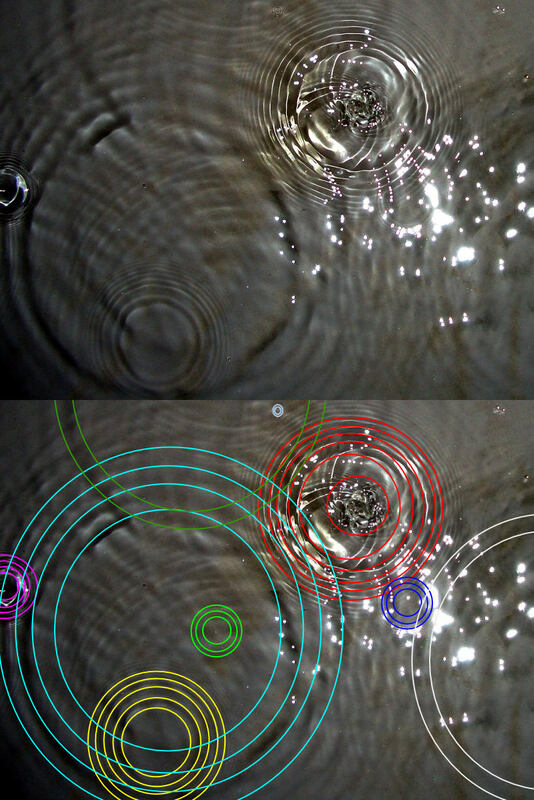 The scenario described above where one might be able to recognise the pond waves from ones own pebble is now increasingly possible through techniques like beamforming with multiple antennas. More control of radio propagation means that we regulate different for different regions in a country. This might mean having different spectrum license holders in different areas or it might mean varying the allowable power output based on geography. The proximity of devices to each other can make a difference. Low power devices that are nearby each other can operate in the same spectrum as much higher power technology but below its “noise floor“. Imagine two people talking to each other at a rock concert. Their conversation doesn’t interfere with a the very loud concert yet they are close enough to communicate with each other “at low power”. I am grateful to Sascha Meinrath for that extremely apt analogy. Some spectrum technologies have a specific orientation, that is to say as opposed to radiating generally, they are pointed in a specific direction. Satellites are a great example of this. They obvious point upwards. This creates an opportunity for re-use of the spectrum in ways that don’t point up e.g. point-to-point terrestrial links. Another means of reducing interference is to use antenna designs that polarise communication i.e. radio waves propagate orthogonally to each other and so reduce interference. Spectrum can also be shared in time. This could happen in big chunks such as someone using television spectrum late at night when the station is not broadcasting to sharing of micro slices of time. Thanks to computing technology, it is possible for the same spectrum to be automatically shared in tiny time slices which give the appearance of continuous connectivity. To date the regulation of spectrum has largely relied on human management and oversight. This places a significant burden on the regulator and is necessarily somewhat slow. New technologies offer the potential for the use of spectrum to be managed dynamically via a database. This would not only lower the barrier to access but could be used to ensure fair play among spectrum holders. Allowing computer systems to dynamically assign spectrum on demand could create both spectrum and organisational efficiencies. A final important thing to know about spectrum is that not all wireless spectrum is created equal. At the lower frequency end of the radio spectrum, radio waves tend to have better propagation characteristics than at higher frequencies. This means they have better reach because they are capable of travelling through solid objects with less signal loss. Thus radio spectrum at the lower frequencies are often considered quite valuable because fewer transmitters are required to cover an equivalent area at a higher frequency. There is a trade-off though: the physics of lower frequencies present bigger constraints to broadband capacity than higher frequencies. So higher frequencies can carry more data but don’t propagate as well while lower frequencies have much better range but are more limited in terms of throughput. So Is There a Crisis? Perhaps crisis is the wrong word. Are we running out of spectrum? The answer to that seems to clearly be that ongoing innovation and efficiency increases will ensure we don’t run out of spectrum for some time to come. So no crisis? Well, not exactly. We still haven’t worked out a very satisfying means of deciding who gets what spectrum and for how long. As a result, there is an apparent scarcity of spectrum as debate about how best to make spectrum available leads to delays, confusion, and missed opportunities. More about that in the next posts in this series.